Space tattoos are as mysterious as the universe that they represent, and human beings have been drawing them for many years. Fascination with the cosmos is not a new thing because humankind has always had a great urge to understand it and to figure out what it is all about. Evidence of this is in cave drawings and other early forms of art from thousands of years ago. With all the research and studies into the universe, there is still little that people can claim to know about it, and this curiosity is what makes people want to have a tattoo of space inked on them. Some represent real things that are out there while most others are just from imagination and fiction. This tattoo also combines the heavenly bodies with other things such as faces and other types of symbols so as to give them a deeper meaning. If you look up to the sky on a clear night what you see will fascinate you. The hundreds of stars in our galaxy are not only beautiful but also very mysterious, and this is just a small fraction of the bodies that you find in space. That feeling that you have when you look up to the sky is the same one that the early men would have. However, in those days it was more intense because the ancient civilizations understood way much little about space than the modern humankind. And so most societies associated everything that they saw up there with some mystical powers and others even believed that the bodies in the cosmos are responsible for the life on earth, and so they worshiped them. For others, the stars were a representation of their ancestors and dead relatives. To show the importance of space and all the heavenly bodies the ancient people would draw them in caves. These early impressions are in the historical artwork of most ancient civilization from the Greeks to the Egyptians and Babylonians. And as people became knowledgeable these drawings were translated into body art where they became a part of the traditional body markings. In the early days, the space tattoos were very simple because most people would have a small representation of the sun or moon as part of their tribal tattoos. The modern cosmos tattoos as they are today are mostly a product of the space race of the 1950’s and 60’s. After the Second World War countries such as USA and Russia had seen significant technological advancement and so there was an intense competition on space exploration between the two. This contest brought about more fascination with space as more and more discoveries came up. And once Neil Armstrong and his crew landed on the moon everybody was curious about space and it was only a matter of time before people started getting inked with tattoos to show their fascination. Over the last decades, the popularity of these tattoos has been on a steady rise, and this seems to go hand in hand with the ever expanding catalog of new discoveries and knowledge on the cosmos. Fictional books and movies about space have also contributed significantly to the increase in popularity of these body markings. A tattoo can have any meaning that you want, and you can also give it numerous meanings depending on your preferences. You can also have one just because you find it attractive and so it is not always necessary to give your body marking any symbolic meaning. However, there are some particular things that each tattoo usually represents and this mostly depends on its origins and also the design. The space tattoos just like any other type have numerous common meanings, and it is a good idea to understand a few of them before getting one so that you know what message you will be passing across with the totem. One of the most common variations of this tattoo is one that entails introducing the face of a woman or a man in space. It is a very attractive design, and most people will have it to show that the individual means the world to them. You can also have this beautiful space tattoo to say that you have found love, and you are in a mystical dimension beside your loved one. It does not necessarily have to be a spouse because you can also have someone important to you such as a mother, child or sibling and so in such cases the space tattoos can symbolize family ties and their importance. These tattoos also symbolize the mysterious nature of the universe. Our cosmos is immense and full of different types of heavenly bodies, and we know little about it. In fact, the world is just a small spec in the universe and having this body marking shows that you adore and respect the mysterious space. Some of the mysteries about space have answers, but most others do not and so you can use this tattoo to show that you are also a mysterious person, or you are a person that likes to look for answers for things that puzzle most other people. However, the greatest meaning behind this tattoo is that despite all the achievements that people make, there is still much more to the story of the cosmos than humanity and so at no point should humankind feel superior. Space is vast, and so you can be sure that there are many things that you can draw. Whether you prefer something simple like a small moon or sun on your wrist or other more detailed things such as a constellation or Nebula there are many options available. You can also get a little creative with your totem and add in the face of something or someone special to you to give the tattoo some extra detail and a deeper meaning. And just like with other tattoo genres, some particular designs and types are prevalent with most enthusiasts. Although they can vary in appearance from one person to the other due to size and color, the idea behind them is the same. Below are some of these common types of space tattoos. The Galaxy is one of the most common types of these tattoos and it works for both ladies and men. It is also a very versatile tattoo, and this is one of the things that make it a favorite of most people. You can have anything from a couple of planets with a few stars in the background or draw a realistic image of the galaxy with all the details that you would expect to see in a telescope. The size that you choose does not matter because this will be dictated by where you want to place your Galaxy. However, it is important to know the right colors to use for this tattoo as they will affect how realistic it will look. Understanding the meaning is also important, but strength and power are the common universal meanings that most people will associate with this tattoo. A rose has many meanings, but people accept it as one of the symbols of love and the galaxy. And so if you do not want to go with the traditional types of space tattoos that include the heavenly bodies you can have a rose as it will still have the same meaning. However, most people will also have some stars around it because roses can have several meanings but having a few stars will ensure that it remains to be a space totem. Roses are perfect for ladies as they are romantic, and you can use their image to show eternal love. The universe goes on forever, and it does not have an end and so having the rose can symbolize that your love for a particular person will last for eternity. Although you can have the roses in any color, it will be more symbolic if you give it a red shade. 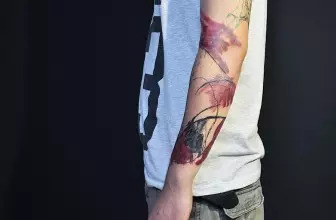 Watercolors are now a part of most modern tattoos, and so most genres have a watercolor variation. 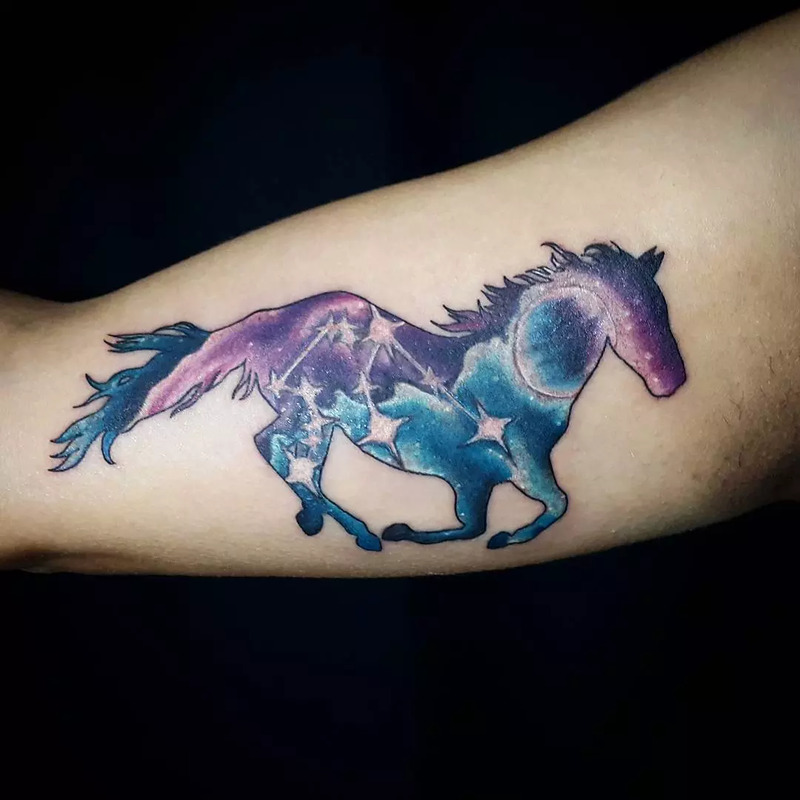 The cosmic tattoos are not an exception because tattoo fanatics that want to keep up with the trend tend to have some beautiful watercolors on their Galaxy symbols. These tattoos do not have to be dull and dark because you can breathe some life into them with these colors. Apart from this, having some beautiful shades can also play a functional role in your tattoos because you can use them to distinguish the different bodies in space. Watercolors also help to enhance particular feature such as the Nebula because you cannot achieve this with the traditional tattoo inks. You may never get the chance to go to space but having a realistic tattoo of what you would expect to see out there is a great consolation. 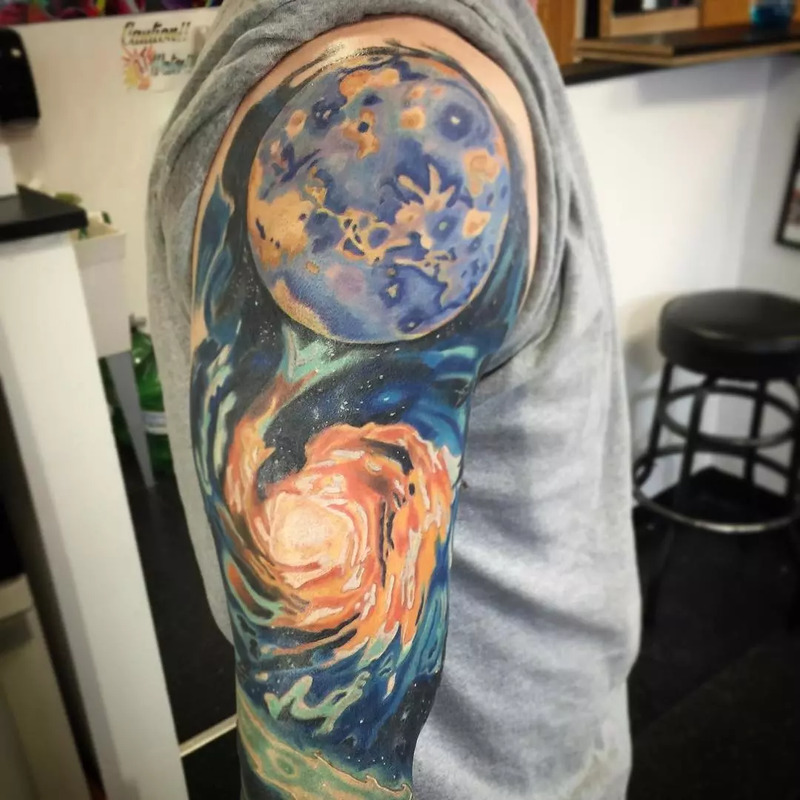 3D tattoos are very realistic, and they try to portray the galaxy as you would see it using a powerful telescope or in a space station. 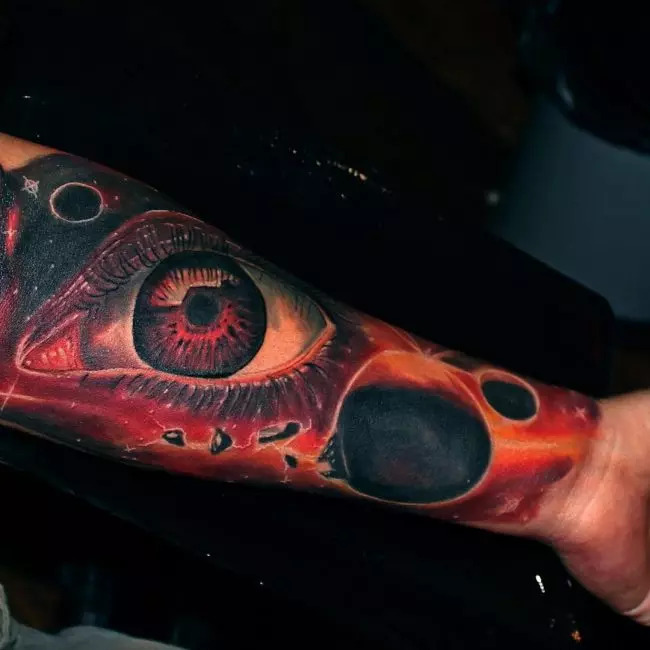 Some skilled artists will even go to the extent of making sure that the planets or anything else that you want are proportional so that anybody looking at the tattoo knows what it is supposed to showcase. 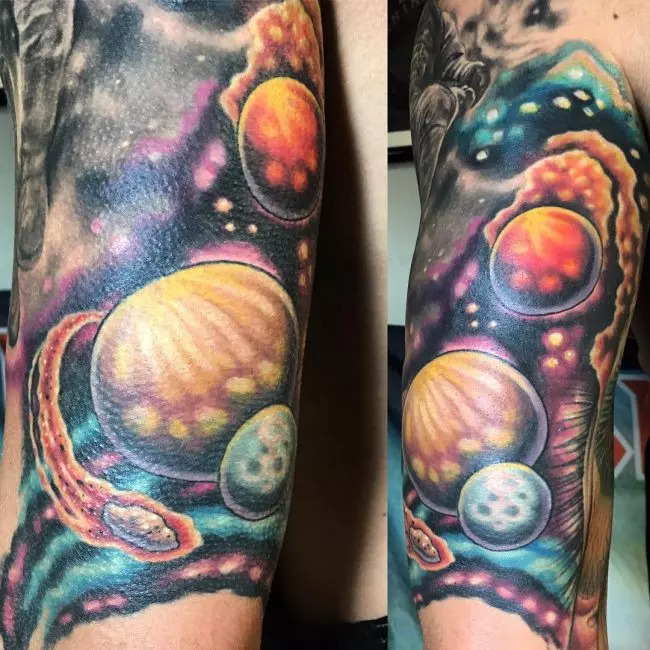 A 3D universe tattoo is very pleasant to look at, and this is more so if you have a beautiful design such as a sleeve with all the colors and the amazing scenes. Few other symbols if at all any are as controversial and mysterious as the “All Seeing Eye” and this is what makes it a perfect inclusion for space tattoos. Some people even think that it is a sign of evil, but this is because they do not know its actual meaning which is awakening the spirits or high spiritual power. Most people will draw the “All Seeing Eye” with numerous stars around it to make it more symbolic. And so if you are looking for something mysterious that will have your friends and anybody looking at it talking about your tattoo then this is a perfect idea for you. However, it looks best when your draw it in 3D and with some bright colors. Animal tattoos are very popular but with some little creativity, you can be able to take yours a notch higher. To do this, you only need to introduce a galaxy to the design, and this will depend on the tattoo type that you have. For example, if it is an otter you can have it swimming in the galaxy with beautiful stars around it. If it is a land animal such as cat or wolf, a perfect idea would be to draw your universe or constellations inside the animal. Space tattoos will look good on any part of the body but where you choose to have yours should depend on the type and also the size. For example, colorful and realistic 3D with all the beautiful scenes of the universe look perfect as a half or full sleeve tattoos while roses would look lovely on your back. If you prefer to have something simple such as the outline of a planet or a small constellation it is a perfect idea to have it on the wrist, ankle or even on your fingers because the little body marking will be more visible in this places. Some people who love tattoos a lot will even have full body tattoo with a space theme. Although you will have to be ready to withstand a lot of pain, the full body universe totems look amazing, and you can use them to tell the mysterious story of the heavenly bodies. Some people prefer to place the tattoos on their hands, and so the upper arm is another ideal location to have a medium sized on. You can even have one on the inner sleeve if you prefer to hide it a little bit. The universe is a mystery that humanity will probably not solve for many years to come. Understanding it is also not easy, and so the best you can do is just to admire it, and one way to do this is by having space tattoos. These symbols are good for you because they will always remind you that there are greater things despite all your achievements and accomplishments in life. They are also breathtaking and so if their deep meaning and symbolism do not convince you to have one, then their immense beauty should. 65+ Mysterious Black Cat Tattoo Ideas – Are They Good Or Evil?